Every day, hundreds of millions of people from across the globe participate in a high-stakes, cut-throat competition that challenges their creativity, ingenuity and intelligence. It is considered the most dangerous, nerve-wracking and alluring field to date with promises of riches and fame to those who possess the necessary amount of charisma and leadership skills. I’m talking, of course, about Entrepreneurship. In America, you can go to any bank and request a loan. With that loan, you are able to start your own business and sell a product. Entrepreneurship does not discriminate against race, religion, gender or sexual preference. It is the very essence of freedom and the epitome of American exceptionalism. This concept has propelled our civilization into a golden age of technological development, and as a result, has dramatically improved the human quality of life. All it takes to start your own business is a clever and well-thought out action plan and plenty of hard work. Unfortunately, that last part is hard to come by nowadays. For the most part, the average human lives a lackadaisical lifestyle compared to those who lived several hundred years ago, and as a result, we are accustomed to convenience, comfort, and instant gratification. These qualities are important to understand, as they are heavily explored in product creation. Take your phone out of your pocket and examine it. Does it feel comfortable to hold in your hand? Is it easy to use and understand? Does it provide you with a sense of gratification when you turn the screen on? If you answered yes to any of these questions, then you are indeed holding a smartphone in your hands and probably absentmindedly checked the time while examining it. These same concepts are the bait on the hook for Multi-Level Marketing companies. Companies like Herbalife, Cutco, Vector Marketing, and many others sustain their duplicitous business practices by preying on young, naïve entrepreneurs fresh out of high school and homebound parents tending to their children with the promise of flexible schedules, considerable pay, and remote work from home. Naturally, these promises seem alluring to those two demographics, as full-time parents cannot be out of the house all day to work, and young entrepreneurs want a steady income that works with their complex school schedules. Unfortunately, nothing in life is as it seems, and many who invest in these companies soon come to find out that they were taken advantage of and are a few thousand dollars lighter than were when they started. The core concept behind Multi-Level Marketing is fairly simple. One man starts a company and establishes a hierarchy. 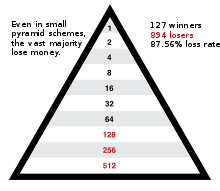 This hierarchy takes the shape of a pyramid, where the first man is at the top, all by himself. It’s at this point the decision between a Pyramid Scheme and a Ponzi Scheme is made. 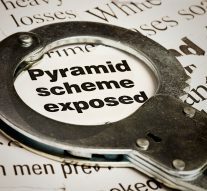 A Ponzi Scheme is just as nefarious as a Pyramid Scheme, except no tangible product is sold. Instead, the product takes the form of an investment, usually marketed as a low-risk, high reward investment that couldn’t possibly fail. Bernie Madoff, a notorious fraudster, was found guilty in 2008 of running the biggest Ponzi Scheme in human history, with damages totaling about $64.8 million dollars spread across almost 5,000 victims who invested a considerable amount of money into his scheme. If the decision is made to sell a tangible product, those who are employed under the company are tasked with selling the product and recruiting more people under them. After being recruited, employees only receive 10% of the profit from their sale, and the rest gets paid out to everyone above them. This is where the scheme begins to fall apart. For example, if you make a $100 deal and are required to give up 90% of your profits to each person above you, your income relies solely on how close you are to the top. If there are 9 people above you, you will only receive $10 out of the original $100 you made. Depending on the company you work for, you could be below 1,000 people who are required to give the same amount to the person above them. Your $100 sale gives the head of the scheme 10$, multiply that by the amount of people working, in this case 10, and the head walks away with $1,000 and he didn’t have to do anything. Meanwhile, the person at the lowest point makes the least amount of money, regardless if they made the same amount as everyone else. The bigger the company gets, the less profitable it is for newcomers, and the more profitable it is for the person that started it. However, the profit margins on these products, be they “essential oils”, protein powder, or any consumable product, are slim to none, and cannot sustain any business model. This is done on purpose to incentivize salesmen to recruit more people. Instead, Pyramid Schemes make money through recruitment. To recruit people, a salesperson must sell them a “Starter Kit” for a pre-determined amount of money. Once you have been recruited, you need to recruit another 10 people and have them give you 10% of their profits in order to make any profit at all, let alone enough to sustain yourself above the poverty line. Once you’ve recruited 10 people, it’s up to those people you have recruited to recruit 10 more people. Now that you have 100 salesmen, those people who just started have to recruit another 10 salesmen if they are going to make a profit. Assuming each salesman recruits 10 people, the company now hosts 1,000 salesmen, each of whom need to, you guessed it, recruit 10 more people. This vicious cycle continues until the public either grows wary of the deceit and stops investing in it, or there is no one left to recruit. This happens around the 8th level, where the odds of success are mathematically stacked against everyone in the company, the head included. It is at this point that everyone in this level of the pyramid must recruit one billion people in order to make a profit. If by some miraculous stroke of divine intervention the company manages to recruit 1 billion people, the next level must recruit 10 billion people. For reference, there are only about 7 billion people living on Earth right now. At this point, it is impossible for the company to recruit any more people, and as a result, cannot make a profit. Suddenly, your boss has just hitched a ride on the next boat to China, never to be heard from again, and any money you invested in the company is now gone. If you are not of the select few at the top, and you most likely aren’t, you will have lost every dime you invested, and you are never seeing that money ever again. This is a cautionary tale to all young entrepreneurs in the world. College students are the most vulnerable to this kind of scam, and only through good judgement can you avoid it. If you ever receive a message from someone involved in a Pyramid Scheme asking you to join them, warn them of their mistake. You could save them thousands of dollars and a significant amount of their precious time. If they believe that what they are involved in is legitimate, let that handsome devil go about his business. It’s up to us to spread awareness of this seemingly ubiquitous scam and prevent anyone from falling prey to their honeyed words and aggressive marketing tactics. America is the land of opportunity, and Pyramid Schemes are a lazy, unreliable shortcut to success. Remember the adage “If it’s too good to be true, it is.” It’s a common phrase for a reason.